Photo above: Gov. Hogan’s Facebook page included this picture of the J.W. 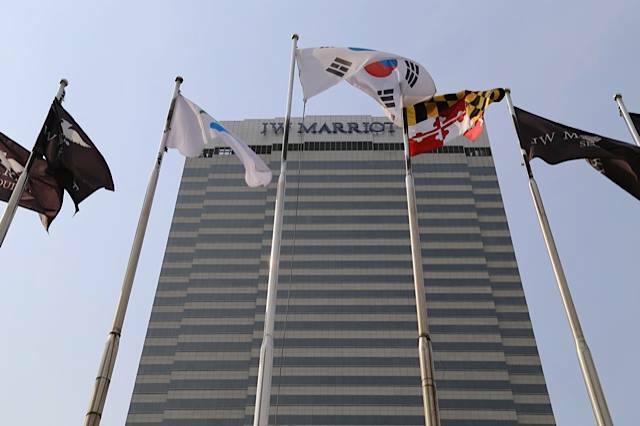 Marriott hotel in Seoul, Korea, announcing he was staying at Marriott hotels throughout his Asian trip. He vetoed a tax bill Bethesda-based Marriott favored. Out of dozens of tax bills introduced this year, Gov. Larry Hogan vetoed one of the only ones that made it through the legislature — the hotly debated and heavily lobbied online hotel sales tax. Proponents of the bill, SB190, mainly Maryland brick and mortar hotels, claimed the online companies are charging but not remitting to the state the same tax the hotels charge. Online travel companies claimed the bill was really a “trojan horse,” an entirely new tax disguised as an effort to even the playing field. Internet travel sites cannot undercut what the hotels themselves charge, and list the same taxes and fees. But after they reimburse the hotels at a discounted rate, they pay the 6% sales tax based on that lower rate, and keep the difference. Hogan, after running on a campaign that promised no new taxes, faced choosing between two business groups, one claiming tax unfairness and the other claiming it was being hit by a new tax. In his veto, Gov. Hogan punted, deferring to a lawsuit against Comptroller Peter Franchot and his attempt to collect the full tax from the travel companies. Franchot has asked the Maryland Tax Court to make Travelocity pay $6 million in back taxes from March 2003 to 2011. “The General Assembly should respect the long standing practice of not passing legislation that would directly affect matters being litigated in a pending court case,” said Hogan in the veto letter. This was an argument used by Republican opponents debating the measure. Hogan’s decision saved him from any accusations of creating a “new tax,” as the online companies charged. However, larger brick and mortar hotels, such as Bethesda-based Marriott International, heavily lobbied in favor of the bill. Marriott employs 10,000 in Maryland within its 75 hotels located in the state. director of government affairs at Marriott International. Maloney described the veto as “highly disappointing.” He says online travel sites are strategizing to preserve a loophole that benefits them and disadvantages brick-and-mortar hotels everyday. Marriott does not believe the Comptroller’s court case will wrap up anytime soon and hopes the legislation will get a second life when the Senate considers Hogan’s veto. As vetoed legislation, the Senate bill will automatically be taken up at the next meeting of the state Senate, presumably in January’s regular session. Hogan encouraged the General Assembly to consider the Tax Court’s ruling, then make a calculated decision moving forward. Madaleno added that he plans to work on overturning the governor’s veto. “I feel confident we will have the votes,” he said. The bill passed the Senate 32-15, with three more votes than 29 needed to override the veto. The House is more problematic. There the bill passed 84-56, one vote shy of the 85 needed to override a veto if the override succeeds in the Senate. On the other hand, the online companies are thrilled, saying the bill would have made hotels more expensive and less competitive, claiming a win for Maryland small businesses and the tourism economy. The Travel Technology Association claimed the bill would also force over Maryland 226 travel agents to charge additional taxes and fees.